NIKE is not Biblical. It comes from Greek Mythology. In Greek mythology Nikewas a goddess who personified victory, also known as the Winged Goddess of Victory. Notice how the image of her looks like the Nike swoosh . Don’t read to much into that though. It has become sort of a myth that the Swoosh represents the wings. The original woman that came up with the logo did it on her own and did not make it out to look like the wings of the greek goddess. We have re-wrote this page as we have been given new information. We used to hold to the belief that the Swoosh was the symbol of another god and avoided it all together. 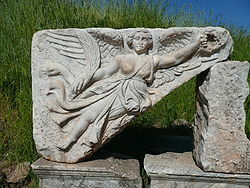 While the Swoosh was never a pagan symbol of a god the name NIKE is a Greek Goddess. We used to have a problem with displaying a Swoosh but we no longer do. If you read the replies on this page you will see why we changed. Thanks to a deeper study by a person that read our post we have changed our mind on this issue. We still won’t display the name NIKE on anything we have but the Swoosh is not a problem for us. So if we had a shirt of something with just the Swoosh we no longer consider that displaying a symbol of another god. Thanks to the person that showed us this. Like the Bible says “Iron sharpening Iron”. let it be heard on your lips. According to that verse we shouldn’t even say the name of the pagan gods. Then we study some more and noticed the names of the “other gods” are written in our Bible at least 34 times. So the writers wrote them down. Hmmmm. WE are going to have to study that a bit more. You can find pagan symbols in most business logos. Apple, Starbucks, adidas added wings to their high tops. How do you decide what businesses to patronize? We are so far removed from HIS way that we have turned back into EGYPT. We personally make decisions based upon the things you mentioned. We have never researched car logos or any other logos except Nike. We try to “change” as we learn. The business doesn’t usually do it on purpose it has just become normal. If we were to own a Mercedes and we learned their symbol was for a pagan God, we personally would remove the symbol from our vehicle. When we learned about Nike we threw out our Nike stuff. We have learned that if HE commands we don’t do something it isn’t okay to then teach it is okay to someone else so therefore we threw things away instead of giving to a non-believer. As far as which business to “patronize” it shouldn’t matter to us. WE are only commanded to not wear the symbols for HIM and to avoid owning anything with a pagan god symbol. If Starbucks has a pagan symbol it is still okay to patronize them, we just wouldn’t allow that symbol to be displayed in our home or on us. Hopefully that helps. We absolutely love the fact that you are now seeing the TRUTH. It will set you free, HE promises that and we are a living example of that. I find this discussion along with the Easter & Christmas ones interesting. I believe one puts values or meaning into symbols or logos, they do not have intrinsic value. Because there is a star for the cowboys or a wing on the note of a Blues jersey, I can’t wear it? My daughter got down headbands she found boring so she glue gunned flowers on them. Should I make her throw them away because the Druids wore flowers in their hair? Following this thought process you are left with only wearing gray clothing with nothing on it. Gray because all colors mean something in pagan religions. One has to look at what the symbols meant to whom. We agree that most things do not have intrinsic value but some do. While having a flower in a child’s hair may have come from a pagan society the question is was that exact same flower a symbol of worship to a god and was that symbol now representing our Elohim (God) or do we wear the symbol knowing it was for another pagan god. While crosses don’t mean bad things to 99% of Christians that wear them that doesn’t alleviate the fact it is a symbol of a celebrated pagan god (Tammuz) and it is now used to symbolize our Elohim (God). As far as colors go, they had meaning way before the pagans stole it. Purple is mentioned in the Bible all the time and a symbol of wealth. Joseph had a coat of many colors. So we believe, if you can, avoid wearing or displaying pagan god’s symbols in your home or on your person. We look at it this way. If Yeshua (Jesus) knocked on our door would we have to scramble to take down pagan god’s symbols from our house or would we invite HIM in with a clear conscience. While we would know we have failed HIM countless times, we have at least eliminated the things we knew the Truth behind. About the Holiday celebrations. The command is to not celebrate our Elohim (God) in the same way the pagans celebrated their gods. Christmas and Easter celebration were adopted practices of the pagans. They were not commanded and they were incorporated into HIS Feast Days in which now have eliminated HIS Feast Days/Holy Days in almost all of Christianity. Christianity has taken completely pagan celebrations and renamed them for our Elohim (God). The other thing to look at is we are supposed to try to grow in Faith and Obedience as we search for the TRUTH. Over time we will eliminate more and more things as we learn more. You already know more than we do about certain symbols. This means we are now learning. This is how it is supposed to work. The more we know the closer we grow to HIM. Technically HE would prefer us to live the exact way HE says not the way society has become. You should also not wear the cancer ribbon as it resembles the fish symbol. The main thing to do is study the scriptures from beginning to end and follow HIS commands. Don’t know why anybody would wear a sideways G but we will take your word on it. We will post a study soon that we have been working on showing pagan symbols incorporated into Christianity and Judaism. The Jewish Star of David is also of pagan origin. So funny I came across this thread googling the biblical meaning for Nike and Strong’s concordance says it means victory I have been having several prominent dreams focusing on Nike sneakers and I believe God is telling me victory is on its way. Sometimes God Himself uses things we can relate to to understand something He is trying to tell us.